One of the six teak benches that will adorn Anthony's Arbor, a pergola constructed in honor of late Stamford resident Anthony Pellicci, at Fairgate Farm. The farm is hoping to raise enough funds to purchase all six benches as permanent seating at the location. STAMFORD — A collection of six new teak benches would be the “cherry on top” of a memorial meant to honor the life of West Side resident Anthony Pellicci. 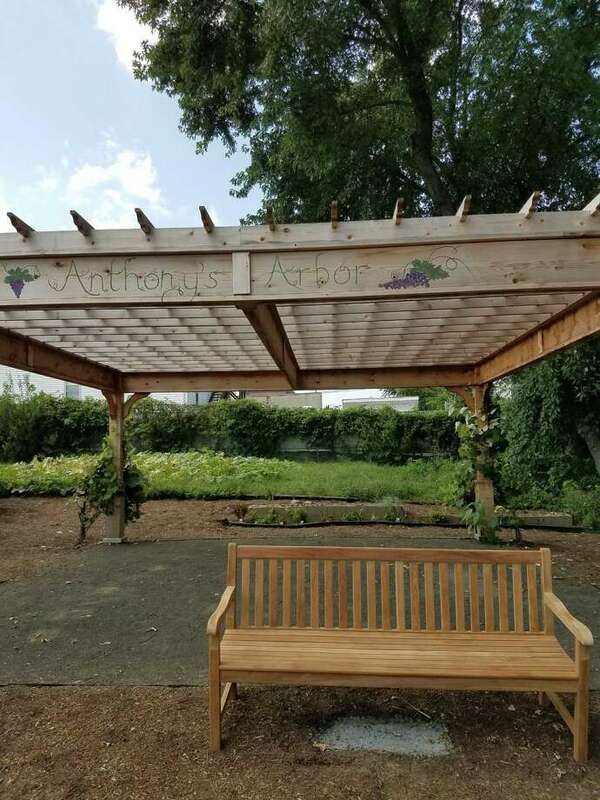 That’s what Vin Tufo, CEO of Charter Oak Communities, sponsor of Fairgate Farm, said of the incoming benches, which would be placed under “Anthony’s Arbor,” a pergola constructed in Pellicci’s memory at the farm. The only obstacle is getting funding for the benches. That’s where The Impact Vine comes in. The organization was launched by The Community Fund of Darien in 2017 to raise money for nonprofit projects, such as Anthony’s Arbor. The farm’s goal is to raise $4,200 to purchase the benches. So far, about $950 had been raised. One bench has been purchased so far, said Tufo. The former owner of Pellicci’s Restaurant was a West Side fixture, involved with many community events and developments. “I couldn’t think of a more fitting way … to really honor Anthony,” Tufo said, adding that Pellicci was a strong supporter of the farm. With the benches, the farm can fully realize its plan to utilize the pergola as an “outdoor classroom,” Tufo said. He said the pergola will be covered in grapevines procured from the homes of West Side residents, helping to create the feeling of a confined space in nature. Fairgate Farm hosts community events and activities including annual volunteer luncheons, gardening workshops, and festivals with live music. Thousands of pounds of fruit, herbs and vegetables harvested at the farm annually are donated back to volunteers, hunger-relief agencies, soup kitchens and homeless shelters. Toni Lupinacci, Pellicci’s sister, said having her late brother memorialized at the farm, in the neighborhood he loved so dearly, means a lot to the family. Those interested in donating can visit The Impact Vine.